177 MEMBERS. 3,878 HOURS EXCHANGED. While exchanges are now coordinated more easily through the use of the internet, there is still a great need in Time Exchanging to maintain contact with the Austin Time Exchange community and the coordinator of the Time Exchange to foster new connections and maintain accountability. Attending an orientation session is a requirement before you can be accepted as a member. This ensures that all members have a shared understanding of Time Exchange. Check the calendar to the right for details on the time and place of the next orientation. Once you attend an orientation meeting with a coordinator, you will be granted access to the online system so that you can develop your profile. To get started exchanging, you can do several things. Create a posting asking for a service you would like to receive or respond to another members request. Post an offer for a service you would like to provide. Or, browse through member profiles until you find someone you would like to exchange with. Part of the mission of the Time Exchange is to build community, as friends, neighbors, and acquaintances will come together to form the core of the Time Exchange. Through one-on-one exchanges as well as Time Exchange gatherings, the Time Exchange creates constant opportunities to rebuild community. Be sure to check the calendar for the most up-to-date event information. The link to the Member Guide (step-by-step instructions for use of the site) is here. 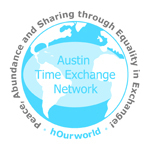 The Austin Time Exchange Network (ATEN) provides a complementary currency that enables members to build community through the exchange of services. Typically, exchanges within ATEN can include nearly any skill or trade: computer or office assistance, minor home repair, painting, cooking, running errands, yoga classes, massage, tutoring, yard services, moving help, haircutting, housecleaning, language translating, etc. any service that one would generally pay for in the day to day. When an Austin Time Exchange member offers a trade or skill to another member, the individual providing the service earns Exchange Shares, the unit of credit exchanged within the Austin Time Exchange. Each time a member performs one hour of work, regardless of the type of skill offered, one Exchange Share is earned by that person. A member will be given one Exchange Share for every hour of service performed for another in the network, whether they are providing acupuncture, gardening, house painting, tutoring, piano teaching, or any other service. Each member's hour of service is seen as being of equal value. There is no physical trading of Exchange Shares. Rather, an online account keeps track of the Exchange Shares earned and spent between members. The member receiving a service from another member is the entity responsible for recording or paying through using the online system. Exchange Shares can be saved indefinitely or spent on any service that another member of the ATEN community has to offer.